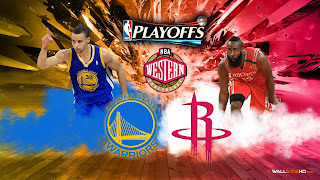 The Houston Rockets were swept by Golden State Warriors in their 4 games during the NBA regular season. Steph Curry averaged 25.8 points and made 51% of his 3pt shots (14-27). Klay Thompson dropped 21 points per game in the series, but shot just 25.9% from beyond the arc (7-27). James Harden scored 25 points per game during the regular season against the Warriors, but like Thompson, shot just 24% from downtown. He made "just" 26-33 of his free throws. Dwight Howard played in just 2 of the games during the season, and averaged 15 points and 10.5 rebounds.